Biodynamic tree paste is applied once a year in late fall after leaf drop or in late winter before the sap flows and before bud break. It is applied in the descending moon (transplanting time in the Maria Thun Biodynamic Calendar) and when the temperature is above freezing. Tree paste is used to provide a protective covering primarily on the bark of fruit trees to enhance the vitality, to help protect the bark from splitting, to discourage insect breeding and infestation, to heal injuries and to cover wounds made during pruning. It may also be applied to fruiting bushes, vines and roses. A coating of the tree paste may slow blossoming so there is less danger of early frost damage. It is recommended for newly planted trees to give them a good start and it is also helpful for ailing or stressed trees. The tree bark should first be gently brushed or scraped to remove moss, lichens and dead, loose bark which provides breeding grounds for insects. 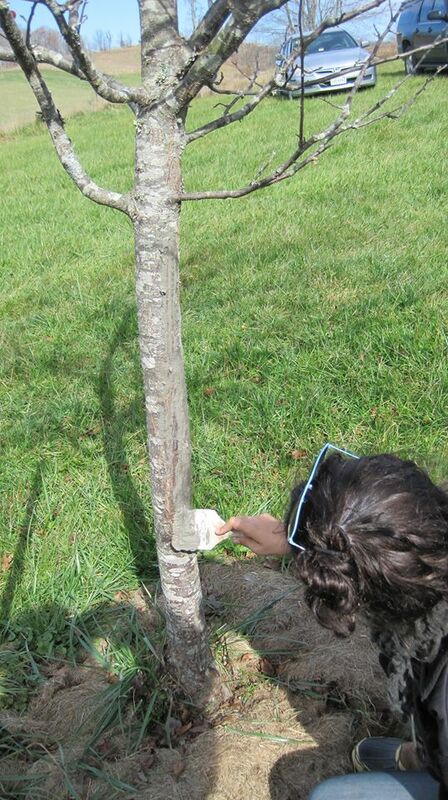 Backyard gardeners can use a whitewash brush or paintbrush to apply the paste by completely covering smaller trees and the trunks and lower branches of larger trees. Care needs to be taken that you do not break off buds as you are brushing the paste on. The paste may be further diluted and strained to use as a spray to cover the upper branches of tall trees. Hand application is impractical for large orchards and the spray is used to cover the whole tree.